"Zoe'ga gra-... What does it really matter anymore." As I sit in my tent, dimly lit by candles and the fireplace in front of me roasting my dinner, I can't help but think and wonder. It'll do that to you, you know. Isolation. Deprived of many senses and even more comforts. The feel of a true bed, the sound of your mother calling your voice to come back home from the meadow while you catch fireflies. The smoking sweet scent of father's pipe tobacco he smoked in the common room after a long day of work. The simple things that give you memories from times past, better times and sweeter times. You would run barefoot down the muddied road after a fresh spring rain, smelling the flowers and freshly watered grass by the downpour, the rolling crackle of thunder leaving the valley to allow sunshine once again break through and cascade it's radiance, blessing us with it's warmth and glow. The mind does strange things, connecting the most specific and familiar smells with memories. I wonder who's side it's on. Mine or the thoughts that engulf me and drive me one step closer to the brink of insanity, one little step closer to ending it all.. No.. No, not those thoughts. The thoughts that keep me up at night, the ones that scare me the most are... Made by me. I am my own worst enemy when left to the devices of these memories and would give anything to just forget and move on.. But it's not that simple. Memories are scars, scars are lessons. We learn, we grow, we fall, we cry and eventually we stand back up.. But sometimes we stand with a posture to that of being wounded or feeble, unable to take another hit, another check of reality, another dose of mortality but.. We stay here. I stay here. Am I a glutton for pain and agony? No. I wouldn't think so.. But even with my mind a tempest of storming seas that have not a sparkle of sunlight left to be seen on the horizon.. I have hope. Hope is my lantern in this maelstrum. Hope is the candle in the black abyss. Hope is the voice in my head, my mother's voice, my father's voice and my siblings voice that say put down the knife as I peer upon my forearms. Hope is a resource for the desperate knowing they've no other options. Hope is easily broken and hard to maintain but... What else do I have but hope for a better morning? For the sun to break through the clouds once again and cascade me with radiance and warmth. Never will I understand how the brain makes you think the most terrible outcomes and make you re-live some of the worst experiences you went through.. But I find it beautiful you can still have hope, even if your own mind wants you to succumb to the end. Your mind will quit before your heart does. Without a doubt, Zoe'ga is a woman of few words and even fewer coins but.. She has never known much else. 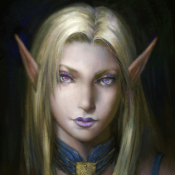 She was born to a Stronghold in the swampy regions of Eastern Vvardenfell. Daughter to the Hunt-Wife, she learned and honored her mother greatly. Very much so to this day, she quotes her mother's 'wise' sayings in conversation. Close to her mother made her learn the tricks of the trade. To hunt without waste, to trap without ruining pelts, fashion clothes, stitch and hem cloth, cultivate soil, make salves and ointments for medicines and topical uses. 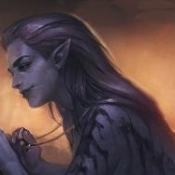 She had a true love for all things nature and truly embracing the Orsimer lifestyle of self sufficiency, honor and law. Though the times did not last, at the age of ten, her entire world changed. Ordinators roving around Vvardenfell set their sights on her smaller Stronghold. Upon discovering, the Ordinators begun their purge. Slaughtering her family, her brothers and sisters, she was not at the stronghold during the culling however upon returning back from collecting worms from the marshes, she was greeted with the sight of fire, blood and ashes.. But how mad could she be? It was not rage that filled her, it was sorrow. After-all... The Code of Malacath states the strong rule the weak... They had been found unworthy to live their lifestyle as they once had... if they wanted to win, they should have fought harder and better. She knew this even at her young age, thus sorrow filled her heart and soul, laying down in the middle of the Hold with the corpses strewn about, wishing, praying she was one of them. Zoe'ga laid upon the stained grounds for about a day, only staring, laying in the mud and blood, not ushering a single word but collecting herself.. I suppose we all grieve in our own ways ofcourse; to Zoe'ga it took a little bit more time to taste reality. Standing up and sniffing, collecting what tools she could find of use to her in her new life, she set out further into the marshes, setting up her own little tent, using the skills her mother taught her about medicine, trapping, hunting and cooking. She is not a 'city-orc'... She is not a 'Clan-orc'... She is simply trying to survive. To what honor in a memory would it be for her to take her own life or go on a blood vendetta? No, no... Her biggest honor she could give to her clan... And the biggest insult she could give to the Ordinators was to live. Even if it seemed much easier and better to take her own life by noose or by blade. It was not the way, it was not honorable, it was not her. Zoe'ga stands at a decent height of 5'11. A decently tall and built orc but definitely not the pinnacle of of height or stature to credit her race. Long, black hair that one could perhaps assume her hair was lighter but she enjoyed keeping it dyed by her own mix of ash and resin. Dying her hair to whatever she was seeming to prefer for the environment. For example, in snowy climates, she will dye her hair grey or white, in more forested environments, dark, earthy colors and so on. Keeping her hair much of the time in braids or in a ponytail just for the sheer purpose of practicalities for it to not get in the way. 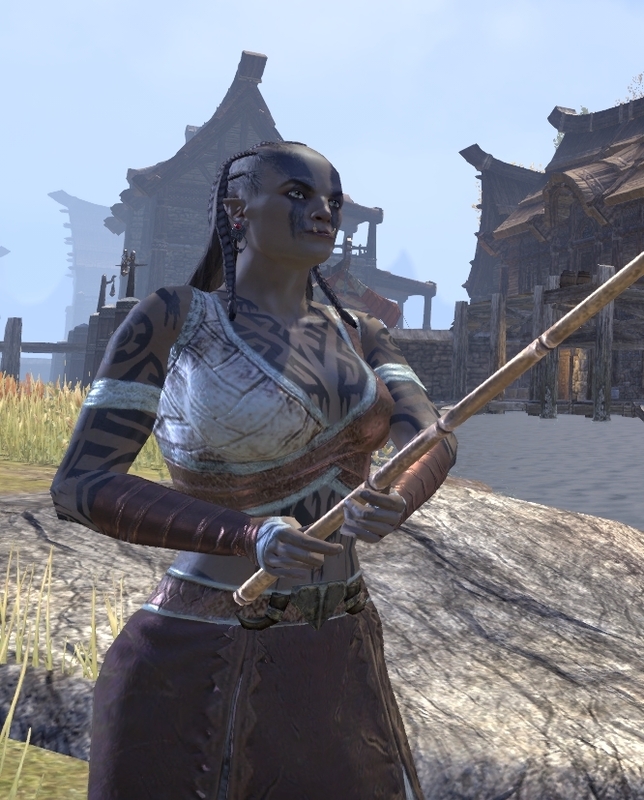 Her muscles were toned and built to still give her credit as Orsimer with dark ash skin and a tint of brown to it. her figure was shapely, her bust supple and plentiful and wide hips. If you'd like to RP or have any ideas for Zoe'ga, DM me on the discord @bobocrunch or message on here! Always a WIP!